It was a long shot. You know, asking Texas teams to knock the Toronto Blue Jays and Kansas City Royals out of the post season. Knock them out for no good reason, except, really, for spite. Spitefulness is not an attractive character trait. I know this, so you can stop with the nose-crinkling. As an Orioles fan, I can’t root for the Royals who soundly steamrolled the O’s in last year’s ALCS and I can’t root for the Blue Jays because … if for no other reason than their fans always seem to be throwing their beer around and I can’t like an untidy country. Even the players begged fans to stop throwing beer. And, they’re a team that likes throwing bats and stuff. I had hopes for those pesky Houston Astros. I really thought they could squeeze past the Royals. But, they let me down. The Texas Rangers over the Blue Jays? Hey, I knew it wasn’t going to happen. But, a girl can dream. Now, I realize, you just can’t count on Texas. It is a very big state with, apparently, nothing to show for it. If you ask the Googler “What is Texas famous for?”, it will tell you … The Alamo, a battle that didn’t go particularly well for the Texans. So really, even Texas can’t come up with anything. Look, I was only asking a couple of Texas teams to win a couple ball games. And, the Texans let me down. Just like the Alamo. Now I’m stuck rooting for the National League, and for heaven’s sake, they let their pitchers bat! What is wrong with those people? I can come up with only three good things to ever come out of the state. First off, my local grocery has an entire freezer case – the whole thing! – dedicated to Texas toast. Imagine that! 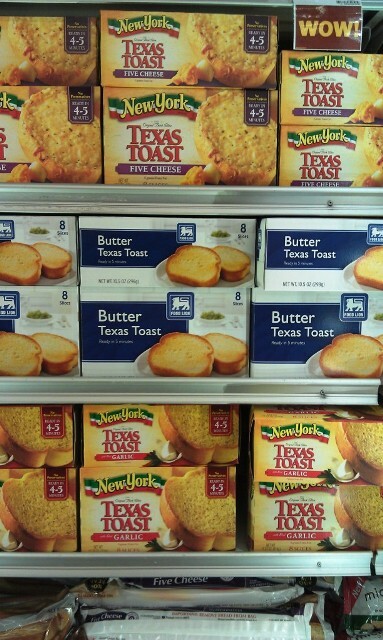 Those Texas geniuses have saved us the trouble of buttering our own toast! They just freeze the toast with the butter right on it. It’s amazing. I was feeling kinda bad about trash-talking the state when they’ve gone to all the trouble to freeze toast with the butter already on it. Then I discovered this. (And, you Texas Toast fans could have told me this and saved me all this trouble.) It’s not even toast! You still have to take your frozen butter-bread and toast the thing yourself. Which just goes to prove my point. You can’t count on Texas for anything. Look! Even the Texas Toast is rooting for the Mets! 2) Chris Davis, (born in Longview and now lives in Arlington, Texas). 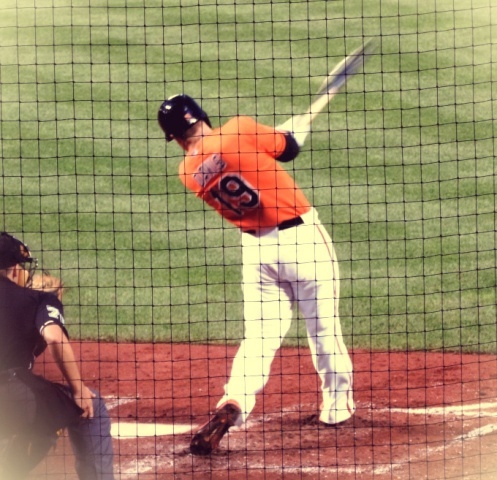 The (still, for the time-being) Orioles’ Chris Davis hit 47 homeruns this season. That’s more than anyone else. 47 homers. This is one of them. It wasn’t enough to get the Orioles to the post-season, but it was enough to help give the O’s a solid break-even .500 season, which, when you set the bar very low, isn’t so bad. 3) Doak Dozier (Ft. Worth). 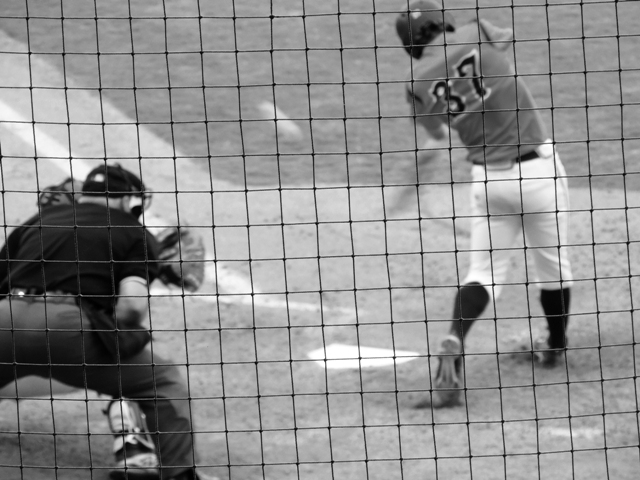 Doak Dozier is a freshman outfielder at the University of Virginia. With only a few “fall ball” exhibitions under his belt this month, I can’t tell you much about his abilities. But, scouts think he’s got potential. At Arlington Heights High School, he was a baseball star, All-State, and named a “Perfect Game” All-American. Here’s what they were saying during this year’s draft. I just think he has one of the best names in baseball. That’s really all it takes to make this list today. So, you can’t count on Texas. Except for Chris Davis (as an Oriole, but not playing for anyone else), Doak Dozier, maybe, I really don’t know, but he has a nice name, and Buddy Holly. But, that’s it. Oh, and those bats in Austin. They’re awesome. This entry was posted in Baltimore Orioles, Baseball, University of Virginia and tagged Chris Davis, Houston Astros, Texas Rangers, University of Virginia by Jackie, The Baseball Bloggess. Bookmark the permalink. Very funny thank you! Grrr. I tried to watch the ALCS but there is too much emotional baggage from last year. I can’t even pick which team I loathe less so lets just say – I hope both teams lose. Yes – neither of the two remaining AL teams bring me any joy. My Blue Jays grudge goes back to 1993 and the All-Star Game at Camden Yards, when Cito Gasten wouldn’t put Mike Mussina in the game. I also don’t like the way fans in Toronto throw things at players (including throwing beer at Nate McLouth when he was with the O’s). I wrote about fans (and different rules that each stadium has regarding fan behavior) last year and singled out Toronto which was far and away considered the worst-behaved fan base in baseball. That is HILARIOUS – great post – thank you for the link to it. No full bodysuits in Cinci huh? Its so hard watching the Royals after last year – especially Eric Hosmer who just annoys me so much. But, I begrudgingly give them credit – they are a compelling group (I kinda like Mike Moustakas). So – I’m with you that given a choice I have to go with (gulp) the Royals. Fingers crossed for the Cubbies! Fun game last night, MB. Congratulations to the Mets! Good things that come out of Texas? — Yup, you win on the niece! — Lots of vistas that go on forever in North Dakota, too … and, with the exception of Roger Maris and maybe one or two random others, none of them ever got far in the post-season either. Once again, Texans are trying to grab onto something — anything — they can be proud of. (I thought jackalope were a Dakota thing, but they’re all Wyoming.) Plus, the world’s largest and second largest jackalopes are in Douglas, Wyoming, proving, too, that things are not always biggest in Texas. Did some of my growing up in the Texas Panhandle and love those long ten mile vistas where you can stand and see forever and also feel like you may be the first person to ever see the place (if you ignore the long lines of newly planted wheat). And I also grew up on beanless chili. Good stuff, and stuff Texans don’t give enough credit to Mexico for. OK … now that I know that YOU lived in Texas, I’ll soften up a bit. I’m rather fond of Austin actually … those bats really are one of the coolest things I’ve ever seen. My niece is from Houston. A number of people I know from Texas assure me that Houston isn’t really part of Texas, but she thinks of herself as a Texan. She assures me that you could never survive in Texas as a vegan. I know that’s true in the Panhandle (at least when I lived there). And I dearly love Austin. Enjoy your chili. Do you eat it with cornbread? Of course! One of my Yoga students brings me fresh-ground cornmeal. So, I guess it’ll be authentic Virginia cornbread! I too was pulling for both the Astros and Rangers. I thought they both had it going and that the Rangers would be in the WS with the Cubs. I do not enjoy watching the Royals and during the last month of the season, finally wearied of Toronto. At this point in the season, I’m only hanging around for the Cubs. You forgot that Farrah Fawcett was from Texas? Byron Nelson? Sammy Baugh? And your boy Doak Dozier was (obviously) named for Doak Walker. And did I mention Farrah Fawcett?. But no, a vegan could exist there, but you couldn’t thrive. 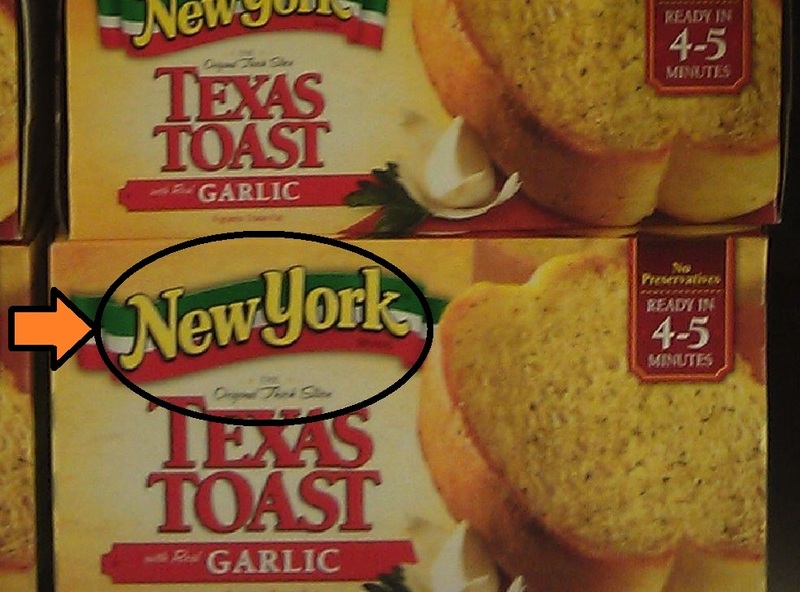 Ha, glad I’m not the only one who noticed the New York / Texas toast discrepancy… It just never made sense to me, but I felt dumb for pointing it out!